In the late 19th century Woolwich Arsenal was just about the most famous football team in the world. Which is extraordinary when you think that the club played in the second division, and never won either the FA Cup nor the Football League. It was famous because it was the adopted club of servicemen throughout the British Empire. Whether they had ever seen the Arsenal play, or whether they even knew where the club played was irrelevant. This was the club of the men who made the armaments that kept the soldiers and sailors alive. It was, deep in their hearts, their club. Such history is revealed in “Woolwich Arsenal: the club that changed football” and to say this definitive book on the early days of Arsenal throws the club’s history up in the air, catches it, and shuffles it around a lot, is rather flowery, but not far from the truth. Forget all those traditional histories of Arsenal that you have seen in handbooks, illustrated histories and the like. Here, for the very first time, we have gone back to the original source material of the era, and found that the story normally told about Arsenal is simply not how it was. Indeed whole sections of the real story of Arsenal have regularly been omitted from histories – largely because the story is based on memories recorded 40 of more years after the events. As such the fact that Royal Arsenal split in 1892 with a rival club being set up in 1893 with the intention of scuppering the Arsenal club is just lost. That ploy forced Arsenal out of their ground, and one particularly nasty trick nearly took the club into bankruptcy. And that was just the start. Newspapers and other contemporary publications have been re-examined, and new insights into why Arsenal ran into financial trouble in 1910 have been unearthed. The story of the club’s move to Highbury in 1913 has been re-examined and is presented in more detail than ever before. Forget the simple old stories about transport problems causing a lack of support at the Manor Ground. Forget the notion that Henry Norris chose Highbury because he couldn’t find any other ground. We’ve looked, read and found the real reasons behind the decisions that transformed Arsenal. For the first time we also look at what it was like to be a spectator at Woolwich Arsenal – and as an away supporter during the era. We’ve found details of the supporters own band, the dancers, and the fireworks made in the Torpedo Factory. No one had seen the likes of it before. Woolwich Arsenal FC was in fact a football revolution. Our book also has the stories over 50 players who graced the Woolwich Arsenal colours – from those who gained the club promotion and played in the FA Cup semi finals, to those who played in historic matches – such as the first ever Arsenal league game, the final game at Plumstead, the first game at Highbury and so on. We’ve even got comments from some of the descendants of the players – not to mention a preface by Ed Humble – the great grandson of Jack Humble. Jack was at the club from 1887 to 1927 – and was the first ever chairman of Woolwich Arsenal in the Football League. The club’s progress in the League is examined season by season, and there is a rare insight into the world of football in the late 19th and early 20th centuries with a detailed look at the teams that Arsenal played in the FA Cup. Such is the depth of analysis in this book that we have included details of club managers who have previously been removed from all records of the club. You will find details of the grounds the club played at, the shareholders, the directors and… well, just about everything. 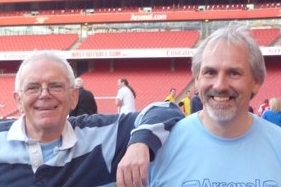 The book has been written by the founders of the Arsenal History Society, Tony Attwood, Andy Kelly, Mark Andrews. The Society is part of AISA, the Arsenal Independent Supporters Association. The volume is published by Hamilton House, and costs £14.95 plus postage. You can buy the book direct from the publishers on line or by phone to 01536 399 011, or you can place an order by fax with a credit card on 01536 399 012.